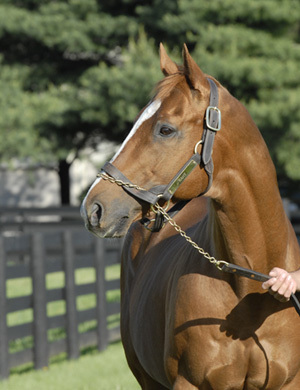 Rahy, one of the best stallions of the past two decades, died last week at age 26 (read more). The pensioned son of Blushing Groom and 1980 U.S. champion mare and Canadian Horse of the Year Glorious Song—herself a full sister to champion Devil's Bag—has sired 91 stakes winners, including 15 grade or group I, for over $73 million in earnings. Glorious Song would later produce Singspiel, an Eclipse champion turf horse and also a very successful sire. Rahy was never a big horse (he was listed at just 15.1 hands), but he was good-looking enough to bring $2 million as a yearling, the third-highest price at the 1986 Keeneland July Sale. Purchased by Sheikh Maktoum Al Maktoum's Gainsborough Stud, the colt was named Rahy, an Arabic given name meaning "born in the springtime," despite the fact that Rahy was a February foal. Rahy began his racing career in England, where he earned a group I-placing at 2 in the six-furlong Middle Park Stakes. He was eventually sent to Neil Drysdale's stable in California, scoring his biggest career win at age 4 in the one-mile Bel Air Handicap (gr. II) by 10 lengths. Retired to stud at Three Chimneys Farm for an initial fee of $15,000, Rahy would sire top runners representing a variety of ages, surfaces, and distances, but he was always most noteworthy for his fillies. One of his first good fillies was Mariah's Storm, winner of the Arlington-Washington Lassie (gr. II), dam of brothers Giant's Causeway (TrueNicks,SRO) and Freud (TrueNicks,SRO), and inspiration for the 2005 film Dreamer. Then there was Serena's Song, champion 3-year-old filly and a $3.2 million earner. She also became a group I producer and is the dam of stallions Harlington (TrueNicks,SRO) and Grand Reward. Rahy's grade I winner Tranquility Lake joins Serena's Song and Mariah's Storm as a Rahy mare to produce a grade or group I winner by Storm Cat, namely through her sons After Market (TrueNicks,SRO) and Courageous Cat. Additionally, Rahy's daughters have produced the likes of Megahertz, Rutherienne, Posse (TrueNicks,SRO), Even the Score (TrueNicks,SRO), and Life At Ten. Rahy's other top offspring include European Horse of the Year Fantastic Light, champion 2-year-old filly Dreaming of Anna, and her grade II-winning brother Lewis Michael (TrueNicks,SRO). 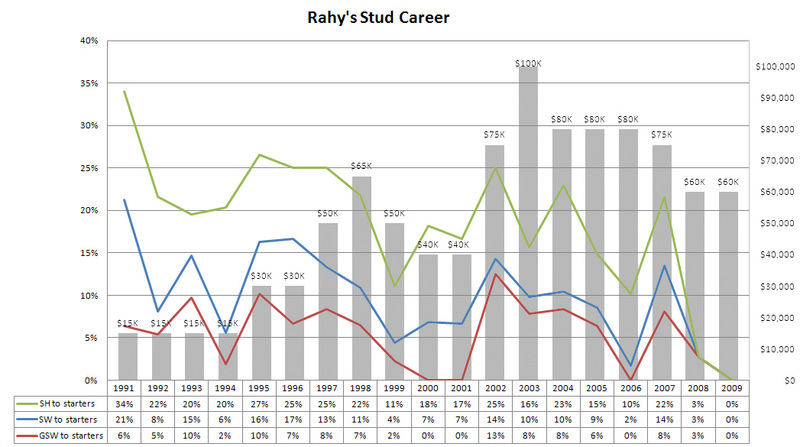 The chart below follows Rahy's stud career by percentage of stakes horses, stakes winners, and graded stakes winners to starters by crop year. As is the case with many successful stallions, Rahy had a hugely successful first crop, getting his highest percentage of stakes horses and stakes winners from that 1991 crop. (Note: crops 2008 and 2009 are not representative as these are only 3- and 2-year-olds, respectively.) These stats are plotted over each crop's corresponding stud fee, and while stud fee certainly over-generalizes book quality, it seems fair to suggest that quality picked up over time. On this graph, the best indicator of increased quality could be the narrowing gap between stakes winners and graded stakes winners (blue and red lines) in the second half of Rahy's career. This suggests that, independent of strike rate, when Rahy got a good runner in his later years, they tended to be very good. One glaring omission from this chart is Rahy's impact as a broodmare sire, a role in which Rahy is already responsible for several top runners and sires. With many of his best-bred daughters just now beginning their careers as broodmares, Rahy figures to have continued success over the next decade and beyond.